"So You Want to Become a Nurse..."
Nursing can be defined as the general care of sick people, as opposed to the medical treatment of their diseases. A professional nurse is able to skillfully combine the art of caring with the science of healthcare. Nursing places its focus on the patient as a whole, rather than on a particular disease or health issue. What are the attributes that I need to become a nurse? A strong desire to become a nurse. Nursing is a calling. If it is your heart’s desire to serve your fellow-man when in need, chances are that you will make a success of nursing as a career. The ability to work as a member of a healthcare team. You will be working closely with other nursing professionals, doctors, specialists and adjunctive healthcare workers like physiotherapists, dieticians etc. Nurses working in a hospital will need to work in day or night duty shifts – typically for 12 hours continuously. Of course this may vary depending on labor laws and regulations applicable in the specific country, state and/or hospital. The bottom line is that in the nursing profession everything revolves around people, and as a professional nurse, you will be working with people, be it patients, fellow professionals, student nurses or the public in general. Both a high IQ (intelligence quotient) and even more so a high EQ (emotional intelligence) are important prerequisites for pursuing a successful career in nursing. 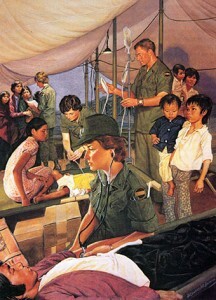 Nursing has been in existence since before the times of Florence Nightingale. The father of medicine Hippocrates (400 B.C.) had a lot to say about nursing. During the Middle Ages a number of religious orders provided nursing care and staffed hospitals. Orders formed after the Renaissance, such as the Sisters of Charity (founded in 1634), with the purpose of caring for the sick and needy. Following the Reformation, the numbers of monks and nuns declined in Protestant countries, therefore the care of hospital patients was left to untrained domestic servants. A German clergyman, Theodor Fliedner was convinced that sick patients needed more than spiritual care. He established the world’s first nursing school at Kaiserswerth, Germany in 1833. Florence Nightingale trained here as a nurse some years later. In 1854 during the Crimean war, she led a team of 38 nurses and they transformed military hospitals from filthy prisons into decent places where the wounded stood a reasonable chance of recovery. In 1860 Florence Nightingale established a school of nursing at St Thomas’s Hospital, London. This school became a model for nursing schools everywhere and marked the beginning of nursing as a profession. Student nurses were trained here for three years under proper supervision. In the 20th century nearly all countries have passed laws regulating the training and registration of nurses. Fulfillment. Nursing offers both an intellectually and an emotionally fulfilling career. Flexibility. Flexibility regarding your specific line of interest, working hours and the opportunity of following a number of different careers within the general field of nursing, make nursing a popular career choice for both professionally and family orientated persons. Financial security. Financial compensation for nurses varies according to geographic location, type of nursing, years of experience and level of education. Job security. Job opportunities for nurses are presently very good. In general ample job opportunities for registered nurses are available for all persons in the nursing profession. In addition, many job vacancies will result from the need to replace nurses who leave the occupation. Variety. Nursing offers an almost inexhaustible variation of specialty fields and other career opportunities within the general scope of the nursing profession. Job satisfaction. To serve your fellow man is a privilege, and one of the most fulfilling experiences available to the human heart. This makes for great material in creating job satisfaction! Rewards. One of a nurse’s greatest rewards is to see a patient leaving hospital, recovered from either surgery or a medical problem, and being able to cope by themselves in society. That is why a nurse’s role in rehabilitation is very important. Let’s put rehabilitation nursing under the magnifying glass! Although the general use of the term rehabilitation is directed toward individuals with residual limitations, rehabilitation is really a part of nursing care in respect of all patients. The primary objective with regards to any patient is to restore them to optimal health and to have them return to their home and community, as independent, productive persons. In this context, rehabilitation nursing is simply a part of the comprehensive care of patients, whose illness or injury has imposed some residual disability or limitations upon them. Through early and continuous contact with the patient, the nurse has the opportunity to contribute greatly to the patient’s rehabilitation. Attitude may have a significant influence on the patient’s progress. It is important therefore, to appreciate the impact of disability on the patient and to develop a positive, motivated approach which reflects and underlines the belief that the situation is not hopeless – that the patient can and will be restored to a respectful and worthwhile life. Tradition and the role of nursing generally accentuates “doing to and for the patient”, rather than encouraging, teaching and permitting self-care. As and when the disabled patient’s condition warrants it, he/she is encouraged to assume more responsibility for their own care. Over-protection and doing things for him/her which they can do for themself only increases their dependence, passivity and feelings of inadequacy. assisting the patient and his/her family in dealing with the psychological impact of the disability in a positive manner. In recent years nursing has endeavored to expand its goals and provide services that are preventive, therapeutic, supportive and restorative in order to assist individuals and families with the promotion and maintenance of their health. Current nursing is patient-centered rather than disease-centered. It has also been expanded to include consideration of the health needs of families, as well as those of the person who becomes ill.
Each individual’s physical, emotional, and psychological well-being is influenced markedly by the relationships, conditions and health practices within the family unit. The provision of care is thus directed toward meeting the total health needs of individuals, with nurses playing a pivotal role. A nurse must be aware of the fact that a patient is a human being in a social setting. He/she has psychological, social, as well as physical needs. One category does not operate independently of the others; the interaction of psychological and physiological factors and their effect on health are well documented. For example: a patient’s rapid pulse, diarrhea, or urinary frequency may result from the effect of fear and anxiety on his autonomic nervous system and its control of body activities and may not necessarily be a sign of a disease. The scope of current nursing practice thus requires much more than the technical competence and manual skills involved in the provision of physical comfort and prescribed treatment. in the modern world of healthcare, nursing is no longer confined only to a bedside. Nurses assist in the delivery of healthcare in a variety of settings, and make contributions as consultants at all levels of government. What skills will I need as a professional nurse? These pertain to the knowledge that the nurse has, and its application in carrying out the nursing process and in providing comprehensive care while working with various age groups such as infants, children, adolescents, and mature, geriatric, and senescent people. Evaluation of the intervening measures. Each step is part of an ongoing process and, as such, requires change, necessitating frequent reassessments. Technical skills: learned through education and practice. For example, the monitoring of vital signs, administration of medicine, provision of fluid, nutrients, hygienic care and comfort, and doing surgical dressings are only a few of the many manual skills performed by the nurse. Interpersonal skills; the nurse needs to have a good understanding of human behavior, adaptation mechanisms, an individual’s values, belief systems and attitudes, and cultural influences. The nurse-patient relationship is of great importance in all phases of nursing. The relationship that is established influences all the nurse does with and for the patient, and can profoundly affect the quality and effectiveness of the service and the final outcome of the patient’s recovery and rehabilitation. As a general rule you may pursue nursing as a diploma course offered by a nursing school, or as a nursing graduate program usually offered by (or in association with) a university’s medical school. The Apprentice Doctor Foundation Course & Kit contains numerous practical projects on CDROM, for this very purpose! Learn how to listen and interpret heart sounds, respiratory sounds, gastrointestinal sounds etc. This remains one of the most basic and valuable patient monitoring skills. Another one of those basic, valuable patient monitoring skills! …and yet another one of those basic though valuable patient monitoring skills! Learn how to evaluate the plantar, the knee-jerk and pupil-light reflexes! Basic examinational procedures explained in an easy to follow step-by-step fashion.